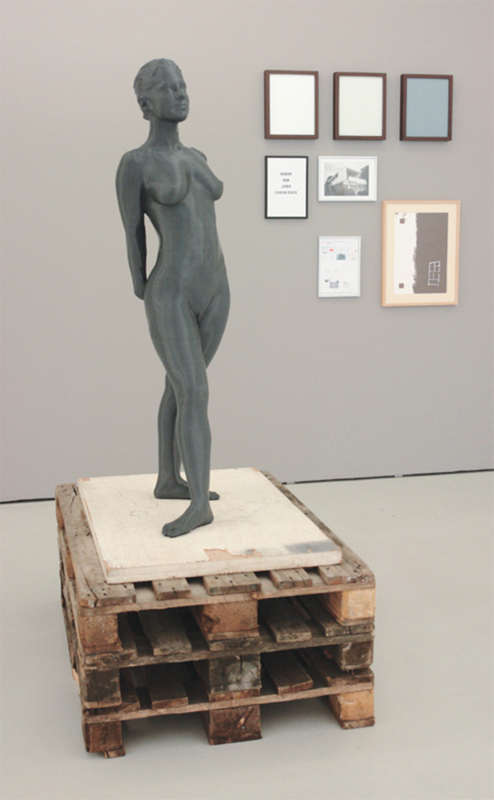 Julião Sarmento, First Easy Piece, 2013, 3-D printed sculpture, ABS plastic, wood, chipboard, water-based enamel on glass, ink-jet prints on aluminum, frames, water-based enamel and acrylic on paper, dimensions variable. The first thing one saw in Julião Sarmento’s recent solo exhibition was Two Frames (all works cited, 2013), a diptych composed of a black-and-white photograph of Duchamp’s Why Not Sneeze Rose Sélavy?, 1921, and a simple schematic watercolor of Degas’s Little Dancer Aged Fourteen, ca. 1881. Together, these images convey themes that have long been of great importance to Sarmento: the history of art in general and of modernism in particular, and the representation of the female body.